Right after dramatically recalling God’s deliverance of the Jews from the Red Sea, Isaiah proclaims that God is “about to do a new thing; now it springs forth, do you not perceive it?” (Is. 43: 19) By his time, the Red Sea deliverance was an old thing, something the Jews repeatedly recalled, especially at the celebration of Passover. But at the time of that deliverance, it was a new thing that had sprung forth. Delivering escaped slaves through turbulent waters just wasn’t in the play books of deities at the time. God had changed the play book and revealed the hitherto unknown truth that God is a God who delivers victims and outcasts from the rich and the powerful. The new thing that Isaiah was proclaiming was another deliverance, this one from the Babylonian Exile. In this respect, the new thing that God was doing was a lot like the old thing: both were acts of deliverance from powerful and tyrannical rulers and both involved leading the people through a desert. One could say that God was actually doing the same old thing that God had done centuries earlier. During the ensuing centuries, the Jews repeatedly recalled the old deliverance, especially at times of crisis such as the Babylonian captivity, bringing the old act into the present in hopes for a repeat performance. Psalm 44, for example, recalls “the days of old” while complaining that the people had been “scattered among the nations” and had become “the derision and scorn of those around us.” Where are the deeds of old? The Psalmist asks. Isaiah replies that the deeds of old have returned, have become “a new thing,” a new act of deliverance. Isaiah affirms that God is a God who delivers victims and outcasts from the rich and the powerful. The old thing is a new thing. A woman pouring ointment all over Jesus to prepare him for his upcoming burial (Jn. 12: 7) may seem an eccentric act but hardly a significant one, hardly a great new thing done by God. But up to that time, how often had any person done such an act of outpouring generosity, giving everything she had in doing it? This looks like God in Jesus Christ completely making this woman, Mary, his own just as much as God in Jesus Christ made Paul his own. This is indeed a great new thing accomplished by God. Will we ourselves be part of this great new thing? I was introduced to the Transfiguration of Our Lord when Raphael’s great painting of the event hit me between the eyes during my student travels in Rome. With the Feast of the Transfiguration coming during my church’s summer slump (and it wouldn’t have celebrated the feast anyway) I knew nothing about it. In many ways, I didn’t have to. The painting opened up a vision of a transfiguration of humanity beyond what I had thought possible. At the time, what faith I had wasn’t centered around any particular religious viewpoint but I was majoring in religion because I thought the subject dealt with the most important things in life. Seeing the painting was more of a religious awakening than I knew. I was, of course, impressed by the sublimity of the upper half of the canvas where Jesus is floating in the air with Moses and Elijah. But I was even more impressed by the inroads the transfigured light made into the lower half which is often interpreted as indicating sinful and benighted humanity. It has taken me years to see further into the significance of this chiaroscuro effect. Now that I have preached on the Transfiguration more times than I can count, I have had many occasions to study and reflect on it. I remain inspired by Raphael’s vision of the transfiguring light and fascinated by the Eastern Orthodox doctrine that holy persons can be filled with the uncreated energies that emanated from Mount Tabor. But under the influence of René Girard’s thinking about the scapegoat mechanism, I am most impressed by the proximity of Jesus’ death and resurrection to the transfiguring light. The narrative begins: “Now about eight days after these sayings.” (Lk. (9: 28) These sayings were about Jesus announcing that he was going to be rejected by the chief priests and scribes and be killed after great suffering, followed by Jesus’ famous words about carrying one’s cross daily. After the return from the mountain and delivering a demon-possessed boy, Jesus said : “The Son of Man is going to be betrayed into human hands.” (Lk. 9: 44) So it is that predictions of Jesus’ passion envelope the transfiguration. Moreover, on the mountain, Moses and Elijah speak to Jesus about “his departure, which he was about to accomplish at Jerusalem.” (Lk. 9: 31) So Jesus and his two great predecessors weren’t exactly whooping it up and playing games with primordial light. Both Moses and Elijah knew a lot more about persecution than they really wanted to know and Jesus knew what the scriptures said about them. As we draw near to Holy Week, the lections focus on Jesus’ anticipation of his Passion. Jesus’ famous response to the Greeks about the grain dying in the ground in order to bear fruit suggests a good deal of serenity on Jesus’ part. But one can imagine personifying a grain suddenly experiencing the pain of being ripped apart from within and panicking that it is dying before blossoming out into a new life beyond imagining. If somebody had quoted Jesus’ words to the grain before it happened, would the grain have been serene about what was to come? A brief reflection on our own nervous state about such an occurrence probably gives us the answer to that question. Jesus seems less serene when he says that his soul is troubled and raises the question if he should ask his Father to save him from this hour. But Jesus’ resolution returns in the very next verse: “No, it is for this reason that I have come to this hour. “ (Jn. 12: 27) The clear echo of Jesus’ anguished prayer at Gethsemane in the synoptic Gospels comes to mind here. Luke is particularly dramatic with the drops of blood dropping to the ground. The Epistle to the Hebrews stresses Jesus’ anxiety more than the Gospels: “Jesus offered up prayers and supplications, with loud cries and tears, to the one who was able to save him from death, and he was heard because of his reverent submission.” (Heb. 5: 7) It is significant that, although Jesus was not saved from death, his prayer was heard. Or was Jesus saved from death? We can speculate on how Jesus himself actually experienced his approaching death but can arrive at no definitive answers. Even the New Testament writers who dealt with it give us varying portrayals. It stands to reason that Jesus’ own emotions were at least as complex as the sum of depictions in the New Testament. But, as the author of Hebrews said many times, Jesus is the forerunner into persecution and death to give us the courage to face both ourselves. Jesus’ “new commandment” to his disciples that they should love one another (Jn. 13: 34) is simple. Or is it? If it were as simple as it seems, everybody would love one another and everything would be fine. But everything is not fine. Violence continues to break out time and time again. We get a strong hint as to the difficulty of this simple commandment by noting the context immediately surrounding this new commandment. Judas has just left the group to betray Jesus. Does this new commandment apply to him? In his first epistle, John follows up the love commandment with a denunciation of the “antichrists” who “went out from us” but did not “belong to us for if they had belonged to us, they would have remained with us.” (1 Jn. 2: 19) So, the “antichrists” had, like Judas, betrayed the Johannine community and once again, we face the pain we suffer through betrayal. The tone of John’s denunciations of the “antichrists” suggests that the new commandment does not apply to them any more than it applies to Judas. Does the new commandment mean it is okay, even righteous, to hate traitors? That is the impression the First Epistle of John seems to give. We all know how difficult it is to have anything but hatred for those who betray us. Loving a traitor seems impossible. For a small community living under pressure and threat, it must have been doubly difficult to forgive those who betrayed them. In Matthew and Luke, however, Jesus commands us to love our enemies. St. Paul and St. Peter say the same in their epistles. Moreover, the story of Peter being called to preach to the centurion Cornelius is a powerful example of Israel being called to expand God’s love to their traditional enemies, the Gentiles. It follows that whatever John may have thought about loving traitors and enemies, the overall teaching in the New Testament would have us understand Jesus’ new commandment in John as extending to everybody, even Judas. We should note, however, that although the synoptic Gospels don’t express the same cold anger at Judas, there is no indication of forgiveness for him, either. The thrust of these reflections is that the new commandment does extend to Judas but that John is also very frank about how difficult, even impossible, this simple commandment is. The key out of this impasse is the rider Jesus adds to the new commandment: “Just as I have loved you, you also should love one another.” (Jn. 31: 34) We are very prone to loving as we love one another. A big part of the way we love one another is to intensify our love by hating our enemies, especially those who have betrayed us. By abiding in our love for others, we hate those who are outside our group. If we abide in Christ’s love, then our love for others expands even to our betrayers because it is no longer our love, but Christ’s that moves in and through us. After all, Jesus had presumably washed the feet of Judas before Judas left. Might Jesus still want Judas to come back to the table? Would we welcome Judas if he should return? Luke’s version of Jesus’ Resurrection is much the gentlest among the synoptic Gospels. No earthquakes and no women running off so afraid that they can tell nobody what they had seen at the empty tomb. The women were, indeed, terrified of the two men in “dazzling clothes” who appeared to them. But by the time, but before long they have remembered, with prompting from the men in white, Jesus’ words to them. Among the words the women were reminded of was that “the Son of Man must be handed over to sinners, and be crucified.” (Lk. 24:7) The key word is that Jesus was “handed over.” Jesus was put into the power of the sinners. However, something much deeper had happened than that. If we look back to Jesus’ prayer at Gethsemane, Jesus struggled with the fear that his ministry had come to nothing, but then he handed himself over to his heavenly Abba. (See Gethsemane) It was only after handing himself over to his Abba that he allowed himself to be handed over into the power of sinners. The death of Jesus is also portrayed more gently in Luke than in Mark or Matthew. Luke does not include Jesus’ anguished cry: “My God, My God, why have you forsaken me!” although Jesus did cry out in a loud voice. What he then said was: “Father, into your hands I commend my spirit.” (Lk. 24: 46) At the last, Jesus in handing himself over to sinners, had really handled himself over to his heavenly Abba. The words, in themselves, seem serene, but, in Gethsemane, where Jesus made his decision to hand himself over, his stress was so great that his sweat became “like drops of blood.” Commending himself to his Abba was not easy. On Easter morning, Jesus found himself alive because he did not try to grab his life with force, but rather, Jesus had given it up. Grabbing his own life with force would have entailed using force to lead an insurrection against the Roman Empire. In doing so, he could, for a time have thought that his ministry had come to something after all. But by trying to make his life secure, he would have lost it. (Lk. 17: 33) In receiving his life from his heavenly Abba, Jesus had the Abba’s life to give to all. This is why it was futile for the women to look for the living among the dead. (Lk. 24: 5) Jesus, very much alive, was not there. 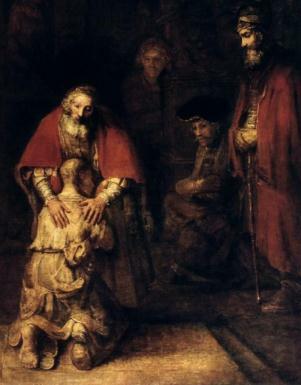 He was among the living, walking on the Road to Emmaus, seeking to make Cleopas and his companion more alive than they were, so that their hearts would burn as Jesus explained the scriptures to them. If Jesus had not given up his life to gain it, he would not have had such overflowing life to give to others. We too, are called to hand ourselves over to Jesus’ heavenly Abba. As our world grows more violent, we are tempted to do something rather than hand ourselves over to our Abba, but doing something in violent situations tends to keep them violent. Instead, we need to create space for the heavenly Abba to give us the life He gave to His own Son. In this way, we participate in Jesus’s death and in his glorious Resurrection. Jesus’ prayer in the garden of Gethsemane may well have been the loneliest moment of all for Jesus. His disciples were not able to stay awake with him. Much worse, his disciples still seem not to have understood anything of what Jesus had tried to teach them. At what he knew would be his last meal with his disciples, a meal when he had poured himself into the bread and wine to give his life to his disciples and all others who would follow him, his disciples fought yet again about who was the greatest. (Lk. 22:24–26) As he had done many times before, he told his disciples that the one who would be first would be the one who served, but he must have realized his words had had the same effect as before. Jesus was alone with his heavenly Abba, but he was having difficulty believing that the path leading to the cross was going to accomplish anything. Jesus prayed that the cup he knew he must drink be taken away from him. Many think Jesus was shrinking from the pain of crucifixion. He probably was, but his anguish went much deeper. Jeffrey B. Gibson, in his book The Temptations of Jesus in Early Christianity, suggests that Jesus was tempted to opt for the restoration of Israel by dominance. It was the same temptation he suffered when he called Peter “Satan” at Caesarea Phillippi, and the same temptation he suffered in the desert right after his baptism. As he prayed in the garden, it appeared to Jesus that his whole ministry had come to nothing and that “the path of suffering will really be effective in achieving the task to which he has been commissioned.” Like us, Jesus felt the pull of the mimetic spiral of violence. It was hard enough that the pull of violence was strong throughout his entire social ambience. It must have been doubly hard that his disciples were still within that social pull of violence and were pulling Jesus in that direction as well. Worst of all, the full wrath of humanity’s rejection of God from the beginning of time had fallen upon Jesus and there seemed to be no way for that human wrath to be quenched. That Jesus accepted the cup anyway shows a profound trust in his heavenly Abba at a time when his Abba’s will was inscrutable to him. It seemed impossible to believe that the heavenly Abba loved Jesus, his Son, and loved all of the people Jesus had come to save, all of whom had turned against him. Impossible, yes, but with God, even these thing s were possible. We saw that the substance of faith and hope consists of actions on the part of God. (See Faith as Faithfulness and Hope as Inheritance.) The substance of faith is the Paschal Mystery of Jesus’ fidelity to the Heavenly Father and all humanity in dying on the cross and rising from the dead. The substance of hope moves further back in time, to the beginning of time, in that hope is grounded in God’s adopting all people as adopted sons and daughters to inherit the vineyard God laid out at the dawn of creation. Love goes further back past the beginning of time to Eternity. It is God’s love that was poured out at the Creation of the world. In God’s eyes, the “vast expanse of interstellar space,” as Eucharist Canon C in the Book of Common Prayer has it, is small in God’s eyes, “a little thing, the size of a hazel nut” as Julian of Norwich images it. But God loves that little thing and “in this way everything hath its being by the love of God.” Julian goes on to explain, based on her visions, that God loves “that little thing” so much that when that little thing in the form of a servant goes on a mission and falls into a ditch, God sends a second servant to get the fallen one back out of the ditch, an act that causes all of the dirt and grime of the pit to stain the clothes of the saving servant. So it is that Julian is convinced that it was love and pity that motivated the Father to send the servant to suffer for the fallen one and that there was no trace of wrath whatever in the process. God’s love precedes and quickens God’s deeds. God’s love transcends time and will never end and will certainly never change, but the effects of God’s love in time can change. We see this with the actions of embracing the cross on Jesus’ part and in the process of inheritance. It is this abiding act of love that we are invited to participate in as the means of being clothed in God’s Desire. Rebecca Adams, a feminist colleague of Girard, offers us a compelling articulation of what God’s love is all about. In an act of authorial generosity (more love in action) Vern Redekop created space in his fine book From Violence to Blessing for Adams to articulate her understanding of love at some length. It was Adams who, noting how Girard tends to stress the negative side of mimetic desire, prodded him in an interview to admit that there was such a thing as “positive mimesis” where mimetic desire works among humans for constructive and humane purposes. Interestingly, Adams gained her inspiration from a Star Trek episode where the pivotal character is a metamorph from another planet. A metamorph is all mimetic desire to the extent that such a person is incapable of any subjectivity so as to be nothing but a perfect mirror of the other’s desires. Such a culture is mimetic desire gone mad. We can see that however mimetic desire works, it is not intended by God to be the destruction of the core of another’s personhood. This metamorph, a woman, is a pawn in an interplanetary marriage arrangement where she will be married to a callous corrupt official. Captain Picard of the Star Trek crew wants to save her from this fate but she can’t even imagine wanting any other alternative, let alone fight for it. Picard solves the problem by desiring that the metamorph have a subjectivity of her own. Because of her susceptibility, she is so engulfed in Picard’s desire that she does begin to desire a subjectivity for herself and thus achieves the beginning of independence. This is sort of like being the “tiny little thing” becoming a hazel nut with the potential to grow into something large (like the mustard seed becoming a large tree). Picard proves to be a fine model of willing the subjectivity of another person, something he must have been doing habitually with the people in his life all along. There is one thought that gives me pause. What if the subjectivity of another person is evil. Adams can’t possibly mean to embrace such an evil subjectivity. For one thing, the mutuality is lost because an abuser tries to destroy the subjectivity of another rather than will it to flourish. Besides, Adams says that she has suffered such abuse so clearly she does not affirm this kind of subjectivity. On the contrary, this experience has taught her the importance of respecting the other’s subjectivity as a mutual process. However, the question that poses itself is: does an abusive person have a subjectivity, or much of one? If all of us can truly be a self when that self is received as gift, then anyone who tries to take away the self of another inevitably takes away one’s own self at the same time. This mutual losing of selves is what happens in the dissolution of advanced mimetic rivalry. The great author of fantasy, J.R.R. Tolkien can help us here. In The Lord of the Rings he powerfully portrays the emptiness of evil in the ringwraiths and Sauron whom they serve. The ringwraiths have enough substance to be covered with black cloaks, ride black horses, and try to seek out the ring bearer who happens to be the hobbit Frodo. But there is otherwise no substance to the ringwraiths just as there is no substance to Sauron who wishes to repossess the ring of ultimate power and bind everyone and everything to his own empty desire. We see the same destruction of hobbithood in Gollum who is just as consumed with desire for the ring as Sauron. Can one possibly will the subjectivity of a ringwraith or Sauron or Gollum? Frodo does respect the subjectivity of Gollum to the extent that he feels enough pity that he will not kill the creature no matter how painful Gollum’s constant nagging presence is. It is this pity and not Frodo’s strength to destroy the ring, which in the end he does not have, that saves the day, for it is when Gollum grabs the ring from Frodo and falls into the volcano that the ring is destroyed. Gollum is pitiable, but can we try to will subjectivity for Sauron? I would answer “yes” with much trepidation for I can hardly imagine going up to a ringwraith to offer him a dose of subjectivity let alone Sauron. Even Captain Picard would be challenged to be this brave. But God does will that a person empty of a self receive a self as a gift so as to be a self. When God so offer the likes of Sauron a self, we can tiptoe into God’s offer to share in it in our own small ways. At this point, love as ultimate respect is forgiveness, another gift of God grounded in God’s love. Let us not speculate on whether or not Sauron ever consents to receive a self from God. Let us ask ourselves if we are willing to receive this ultimate respect ourselves from God and offer it to others.